If you’ve already had a moment to glance at our new line of handbags, you will have certainly noticed that many of the new designs are indeed made from genuine anaconda leather, used either in combination with other leathers, such as ostrich, or on its own to give the accessory even more elegance and make your look more and more chic and refined. But what does anaconda leather look like? What is it and what are its distinctive qualities? How can we distinguish genuine anaconda leather from python? These are some of the most frequent questions asked by those customers who had the chance to preview our new collection. We would like to give precise and definite answers to these questions, since, while most of us know that anaconda is an exotic species, not everyone knows much about its leather and, above all, why it is considered more precious than python. Let’s start with a general presentation of this species, looking at its qualities and its geographic location. Anaconda can be defined as a large snake, probably the biggest in the world, as some species of green anaconda (Eunectes Murinus) can even reach a length of 8 meters and weigh over 200 kilograms; however, these are rarities, given that the anaconda’s average length usually doesn’t exceed 6 meters and yellow anaconda (Eunectes Notaeus) can reach a maximum length of 3,6 meters. Anaconda primarily lives in South America, in particular in the fluvial territories of Brazil, Bolivia and Paraguay and near the basins of the Amazon and the Orinoco Rivers. Wetlands, such as swamps, ponds and rivers, form their natural habitat. Its skin is mainly characterized by small and even scales over the whole surface, without any variation. Unlike the scales defining python leather (whether Reticulatus or Molurus) where a contrast between the small, rounded scales and larger more elongated ones can be easily perceived, those characterizing anaconda skin have the same dimensions and shape, which makes the leather itself really unique and of superb beauty. While this is the most obvious difference distinguishing anaconda skin from python leather, it is not the only one. The other important difference lies in the reproduction of the natural pattern of the animal: it is almost always kept on python leather, not only because of the scales with their variations of shapes and sizes, which tend to re-design the animal look, but also because of the colours and shadings, sometimes also contrasting, applied during the colouring process, which certainly contribute to give an impression of the python in our mind as a real animal and not just as an exotic leather. Anaconda skin, on the other hand, in its natural state, is characterized by many small dark coloured spots on a solid base, randomly scattered spots that don’t have any regular pattern or texture. This is why, once the leather reaches the tannery, it tends to be bleached to obtain a new linear and homogeneous tonality, without any shading. A genuine anaconda leather bag is usually in a solid colour, because the natural pattern of the animal isn’t easy to reproduce, and the even, equally-sized scales don’t lend themselves to the application of shaded tonalities or of several contrasting colours, as, happens with python. If viewed from afar, a genuine anaconda leather bag could be misleading, because the perfect and homogeneous distribution of scales over the surface might suggest that it is simply embossed leather (how many times, in our previous articles, have we warned you never to trust a genuine python or alligator handbag where the scales look too perfectly homogeneous and uniform, since, in many cases, it may be embossed leather: it may even be high quality, but embossed leather nevertheless – imperfection is a sign of genuineness and naturalness). However, after a more careful and closer look, you will immediately realise that, what you are looking at, is not simple embossed leather but genuine anaconda leather, really soft to the touch, malleable and adaptable to any shape of handbag, from the most structured to the softest. An embossed leather, however high quality, would never be able to give you all those tactile sensations of wellbeing and harmony that genuine anaconda leather guarantees any time you touch it, and this is a fact. Anaconda too, like python and alligator leathers, is subject to controls by CITES organizations which regulate trade and carefully check the legality of import licences. The number of import permits issued for anaconda is significantly lower than for python and this is why a genuine anaconda leather bag is more expensive than the same model made of python. Anaconda leathers (always referring to regularly imported and registered leathers with the correct documents and certificates) are more difficult to obtain than the classic python ones; thus, a product made from this skin is that much more precious and unique. As you can see, there are many qualities characterizing this extraordinary anaconda leather, qualities that we really hope will soon make you fall in love with it, as happened to us from the very first moment we saw it. 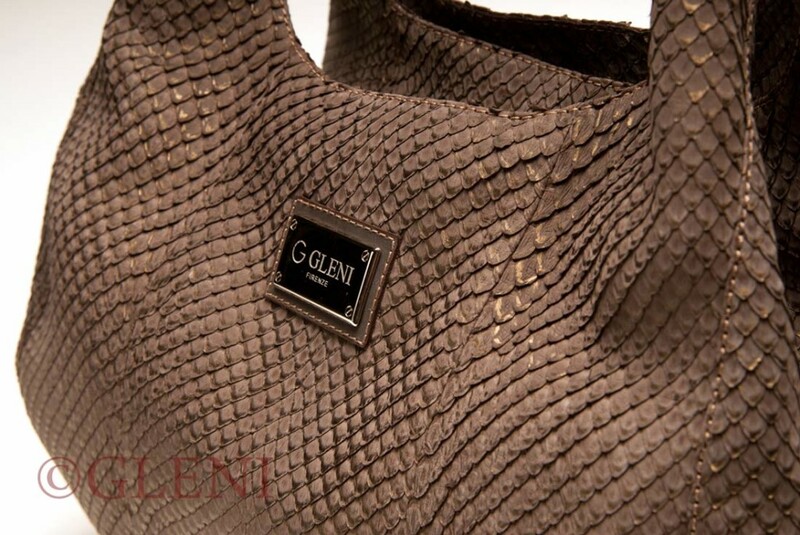 But…if the spark has not definitively struck yet, we invite you to take a look at the genuine anaconda leather bags available in our Gleni Boutique at www.gleniboutique.com. You won’t remain indifferent in front of such a refinement!